Neal S. ElAttrache, MD will be installed as the 47h president of the American Orthopaedic Society for Sports Medicine (AOSSM) on Saturday, July 7th, 2018, during the Society’s Annual Meeting in San Diego. Dr. ElAttrache is an orthopaedic surgeon specializing in sports medicine at Kerlan-Jobe Orthopaedic Clinic in Los Angeles. He is a member of the Kerlan-Jobe Orthopaedic Clinic Board of Directors, Chairman of the Board of the Kerlan-Jobe Orthopaedic Foundation and Program Director for the Kerlan-Jobe Fellowship. 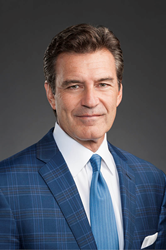 He also serves on the Board of Directors and as Co-Chair of Medical Affairs for the Cedars Sinai Kerlan-Jobe Institute. “I am honored to be inducted as the AOSSM president and look forward to continuing the organization’s legacy as the leader in sports medicine education and research,” said ElAttrache. Dr. ElAttrache is the Head Team Physician for the Los Angeles Dodgers Los Angeles Rams and serves as the orthopaedic consultant to the Los Angeles Angels, Los Angeles Clippers, Los Angeles Kings, and Anaheim Ducks. He also served as on-site senior surgeon during the 2008 Beijing Olympics. After completing his studies at the University of Notre Dame in 1981, Dr. ElAttrache earned his medical degree at the University of Pittsburgh in 1985 where he also completed his internship in general surgery and his orthopedic surgery residency before becoming a sports medicine fellow at Kerlan-Jobe Orthopaedic Clinic in 1990. Dr. ElAttrache joined Kerlan-Jobe Orthopaedic Clinic directly following his fellowship. He has served on the Boards of many orthopaedic organizations, including Herodicus Society President from 2016 to 2017, American Shoulder and Elbow Surgeons Executive Committee and Program Chair for AOSSM. Additionally, he has memberships in the American Orthopaedic Association, Alpha Omega Alpha Honor Medical Society, the American Academy of Orthopaedic Surgeons, and the NFL Physicians Society. He has authored 35 text book chapters, 94 research journal articles, 10 orthopedic instructional videos, and has given more than 325 lectures at national and international orthopedic surgery conferences.